Mailbox Toluca Lake’s Jona-than Kramer (right) is “Doctor Voice” to the superstars. 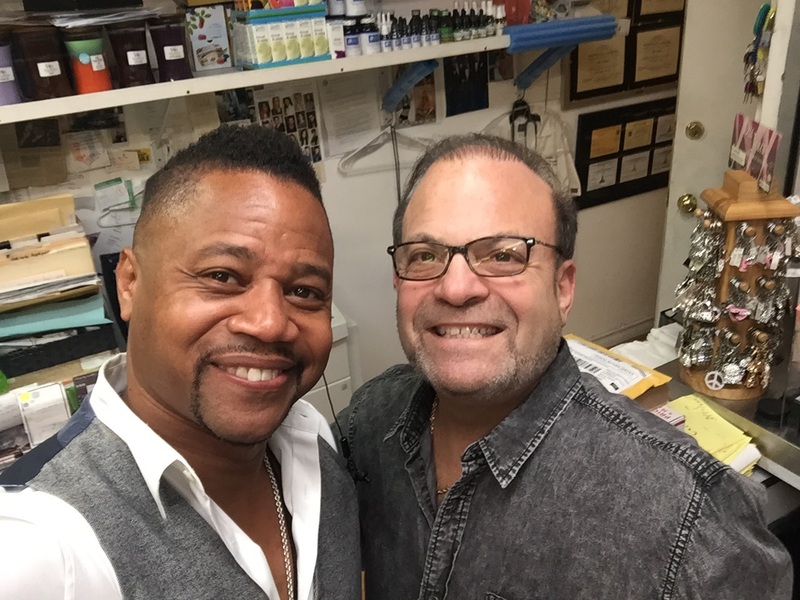 Here he is with actor Cuba Gooding Jr., one of his happy customers. For decades known as the unofficial “Town Hall,” it’s where ideas for movies and shows have been hatched, and where there are at least 1,000 mailboxes designated to mostly people in the entertainment industry. There are rotating racks of greeting cards by the entrance, and shelves against one wall loaded with stuffed toy animals. Of course, FedEx and postal services are available. He recalls how his mother and sisters have a chronic cough, and one of his cousins bought his mother a box of Grether’s Pastilles, handmade throat lozenges from Switzerland. Kramer still sells them today, handing this writer a sample of Blackcurrent Grether’s Pastilles “for throat and voice” from a bag of samples he says he is always giving out. The netted sample voice bag also includes a tube of Nin Jiom Pei Pa Koa, an herbal-based honey loquat syrup for fatigued voices. There is also a small spray bottle of Thayer’s Dry Mouth Spray, Ginger Honey Crystals Tea, 100 percent Raw Manuka Honey, Throat Coat Herbal Tea, a Wedderspoon Manuka Honey Lollipop and various other throat lozenges. Recently he discovered two new products, Gargle Away Throat Care primarily for strep throat and opening the vocal range, and Honees throat lozenges made in Italy. These products have quickly become top sellers in the store. “We get solicited by companies that want this sample voice bag,” Kramer said. “We have over 66 items. I give out samples all the time.” Mailbox Toluca Lake’s extensive online catalog also includes brand names such as Tiger Balm liniment. Also included are Superior Vocal Health dietary supplements for clearing sinuses, alleviating stage fright, a tired voice gargle and combating head colds. Kramer says several recording studios keep his merchandise in stock for their clientele. Voice coach Eric Vetro, who has trained stars such as singers Ariana Grande and Katy Perry, refers all his clients to Kramer’s store, while Burbank ear, nose and throat specialist Dr. Warren Line prescribes Kramer’s products to his patients. “I’m a mass marketer,” he declared. Kramer says he hopes to expand his line of vocal and health products, and take all six of his staff members to the Natural Products Expo West in Anaheim in March 2018. For more information visit MailBoxTolucaLake.com or call (818) 505-9350.